Re: Case creasing after firing? It's a feeding issue. One of the pistolsmiths would be able to tell you more, but the "smiley face" mark is from the transition from barrel throat to chamber. You might try a different magazine or a longer nosed bullet. I think it is being done going into the chamber. In a safe place try cycling your slide and check if it happens going in or coming out. You don't want to shoot it just cycle it. I think the profile on your bullet might not be tipping your case down enough. And it could be caused by your magazine instead of the profile of the bullet. LenV wrote: I think it is being done going into the chamber. In a safe place try cycling your slide and check if it happens going in or coming out. You don't want to shoot it just cycle it. I think the profile on your bullet might not be tipping your case down enough. And it could be caused by your magazine instead of the profile of the bullet. Len is right about cycling some rounds through the gun to see what's happening, but you can make some dummy rounds and try them at home. Jon Eulette thought (in an email) that it was a magazine-related issue. I was using two Wilson Combat 8 round mags. One was an original that I got with the gun and Jon had seen - the other was a new mag I purchased. I looked very carefully today and the feed lips are slightly different. Since I was alternating between the two mags for 5 shot strings, that would definitely explain why I had 50% case damage. I will make up some dummy rounds and dig in further. 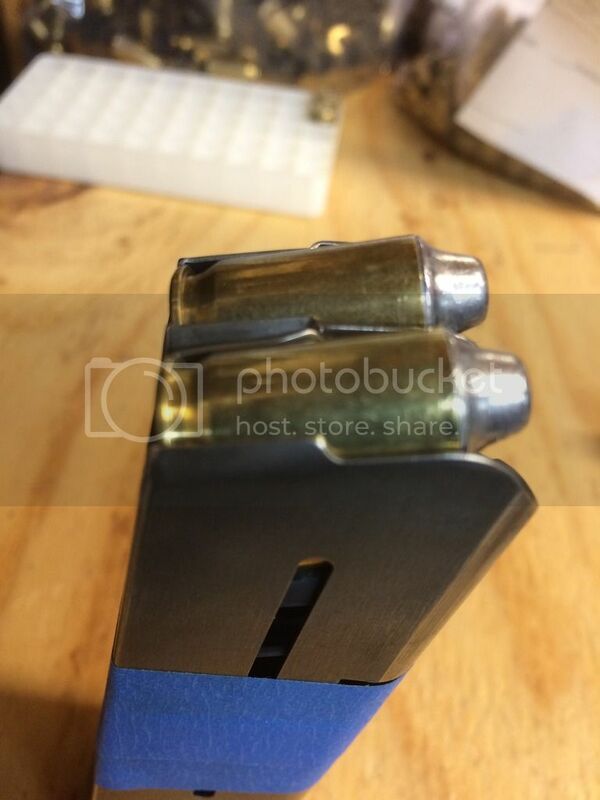 If rear of cartridge is released too late from magazine the side of the case can bind with rollover point of chamber (transition of barrel feed ramp to chamber). The cartridge is entering chamber at steeper angle and creases side of case. 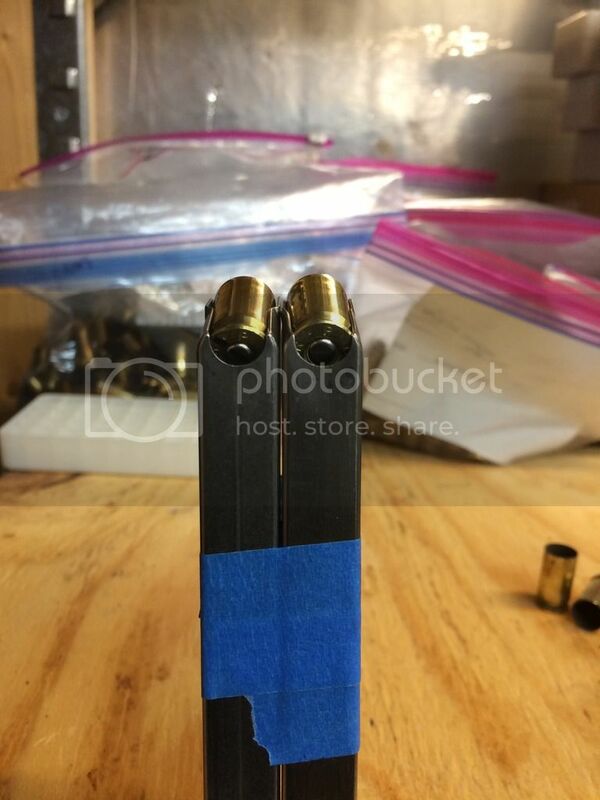 That's one of the reasons top shooters only use 1 magazine because it was tuned for the pistol to feed properly. Just because a magazine feeds doesn't mean its right. I cringe when I see gun boxes with 10 45 mags magnetized to the lid. 10 magazines equals 10 different things going on; feed lips, spring tension, seating height, etc. it is always interesting to see the differences a mag will make on groups. I occasionally have first-round-in mag feeding issues with those same bullets (or at least ones that look just like that... I have Magnus #801, 185gr LSWC BN (Button Nose) improved H&G 130-style). I haven't noticed the smiley face crease, but I have had them get jammed. So I'm curious what the fix is. 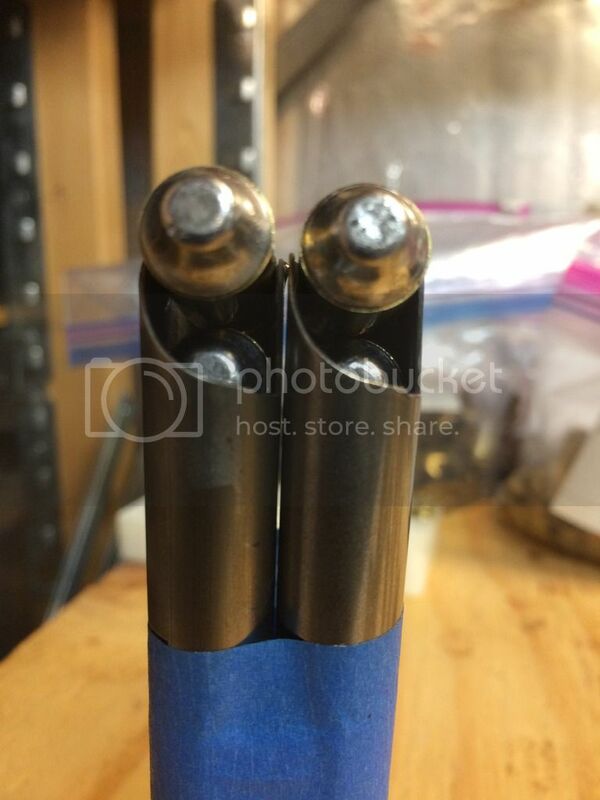 Hi Aprilian, I don't see a crimp on the loaded round; is there a taper crimp on your loaded round? the naysayers that 45acp lswc should only have the belled case straightened, that's B/S. resolution to your creased case problem. Tony, Taper crimped to .4695 using a caliper as a go/no go gauge. Then I can tell if the newer mags can be tuned to be reliable in my gun or if they need to find a new owner. After that experiment I will try to recreate the crease with dummy rounds. The feed lips on the two original Wilson Combat mags are different from the two newer ones and from a new Les Baer. The originals present the round slightly higher and slightly further forward. I didn't understand the subtle lip shape differences when I bought the 3 spares (I am new to a lot of things). Now I understand the probably cause, but will still do some dummy tests to confirm. The metal lips are different enough shapes that I can't just bend them to match the originals. I will post a separate question asking where I find more like my original. Magazines - there are many good and some great. Mec-Gar, Metalform... there are many that work well. I prefer Tripp Research (founders of STI), I have over 30 of their 7R-45-WG mags and they never have let me down. I did some extensive testing and found that there was no or very little difference on point of impact with any of their mags, they are that consistent. I use to load 18 mags for a match so I never had to reload. I quit doing that because my shoot box was just too heavy. They are a thing of beauty and expensive. dronning wrote: Magazines - there are many good and some great. Mec-Gar, Metalform... there are many that work well. Your going to give Jon Eulette nightmares with that picture. Aprilian wrote: The feed lips on the two original Wilson Combat mags are different from the two newer ones and from a new Les Baer. The originals present the round slightly higher and slightly further forward. I didn't understand the subtle lip shape differences when I bought the 3 spares (I am new to a lot of things). Now I understand the probably cause, but will still do some dummy tests to confirm. 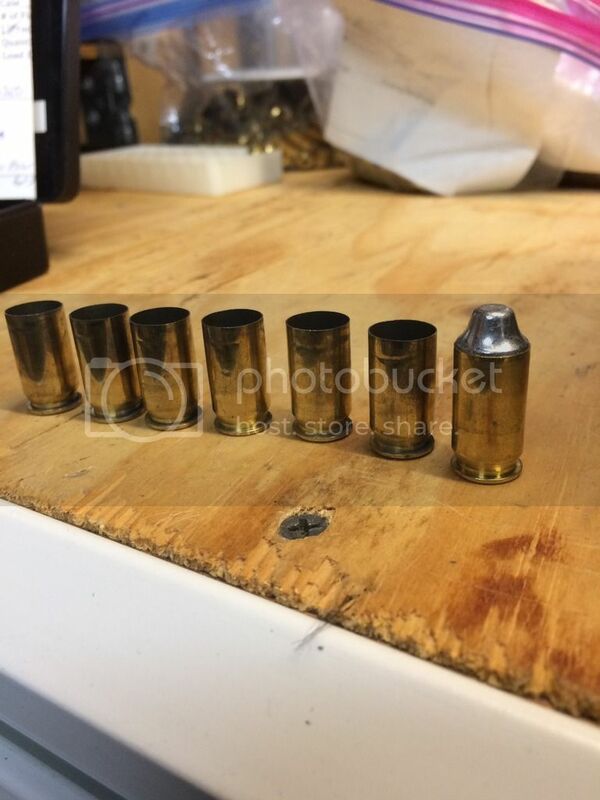 Do you have pics to show the differences in the feed lips and how they present the round? What's the probable cause... that the newer mags hold the top round lower, or that they hold it slightly further back? Wilson Combat just confirmed they are both stock 47D mags. The one which presents the round higher (the "older" one) is prior to a design change which was roughly 15 years ago. Thank you for taking the time to write us. I looked at your photo and both of those magazines are item #47D. The one on the left is one of our older#47D and the other one is our new remodeled #47D. Thanks! I went back and looked at some older mags. Jenny is correct. That must be an older satin finished mag(15 yo?). These were optimized for 200 grain SWC..we no longer make that lip design. well it's just me, but I'd take the mag that doesn't work and bend the lips out to match the one that does work... a small crescent wrench works well if you don't have a mag tool. I ran the H&G 130 a lot in my former BE life.. and I had to modify the lips and follower to present the round higher.. today I'd just use a higher Mag catch such as the one made by EGW. Thanks to Jon I just fixed my EIC 45 to feed Nosler 185s by simply using the mag catch..
Well I've been running the Magnus 801's and use Check Mate hybrid 7 round mags now for years and never had any problems with ANY 1911 I used them in from Colt's to Kimbers to Clarks and one I built myself on a Caspian frame. Never a FTF. I would just trash the one that doesn't work and buy new ones but that's just my 2 cents.